A 35-year-old man who had been in a vegetative state for 15 years after a car accident has shown signs of consciousness after neurosurgeons in France implanted a vagus nerve stimulator into his chest — challenging the general belief that disorders of consciousness that persist for longer than 12 months are irreversible. After one month of VNS — a treatment currently used for epilepsy and depression — the patient’s attention, movements, and brain activity significantly improved and he began responding to simple orders that were impossible before, the researchers report today (Sept. 25, 2017) in an open-access paper in Current Biology. For example, he could follow an object with his eyes and turn his head upon request, and when the examiner’s head suddenly approached the patient’s face, he reacted with surprise by opening his eyes wide. “After one month of stimulation, when [electrical current] intensity reached 1 mA, clinical examination revealed reproducible and consistent improvements in general arousal, sustained attention, body motility, and visual pursuit,” the researchers note. Brain-activity recordings in the new study revealed major changes. 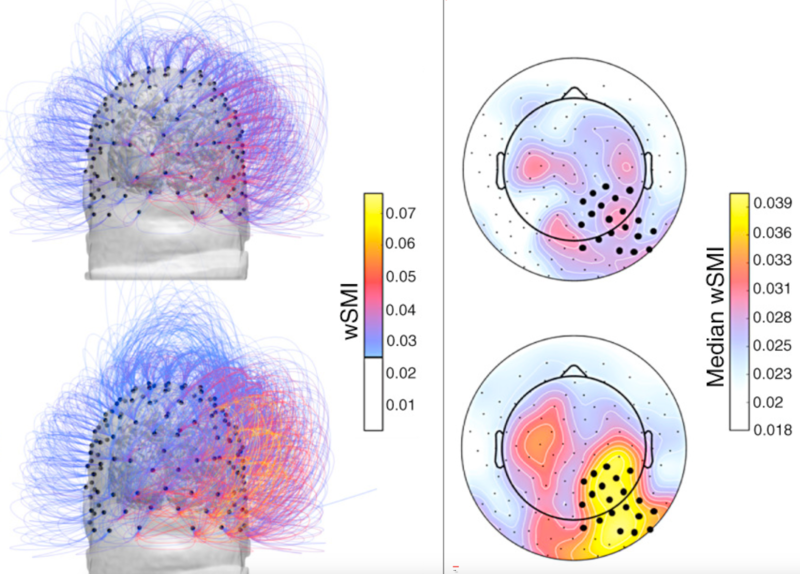 A theta EEG signal (important for distinguishing between a vegetative and minimally conscious state) increased significantly in those areas of the brain involved in movement, sensation, and awareness. The brain’s functional connectivity also increased. And a PET scan showed increases in metabolic activity in both cortical and subcortical regions of the brain. 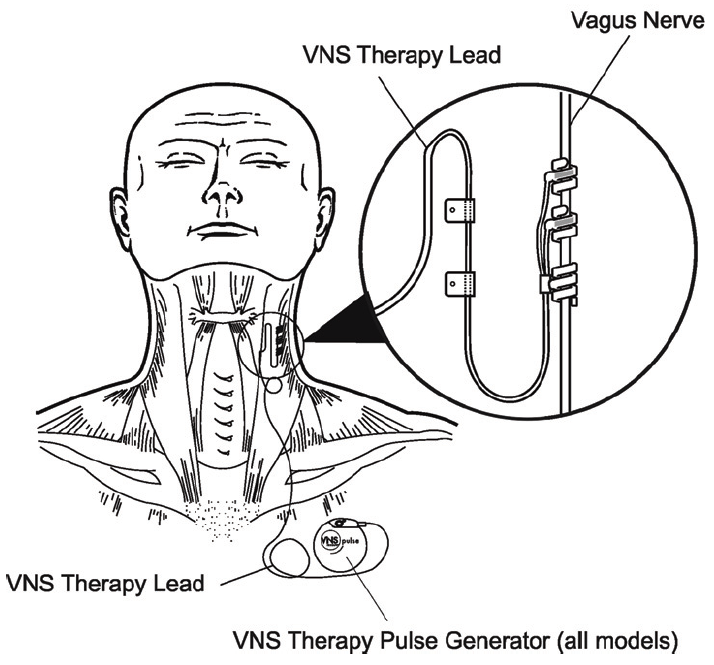 The team is now planning a large collaborative study to confirm and extend the therapeutic potential of VNS for patients in a vegetative or minimally conscious state. Patients lying in a vegetative state present severe impairments of consciousness  caused by lesions in the cortex, the brainstem, the thalamus and the white matter . There is agreement that this condition may involve disconnections in long-range cortico–cortical and thalamo-cortical pathways . Hence, in the vegetative state cortical activity is ‘deafferented’ from subcortical modulation and/or principally disrupted between fronto-parietal regions. Some patients in a vegetative state recover while others persistently remain in such a state. The neural signature of spontaneous recovery is linked to increased thalamo-cortical activity and improved fronto-parietal functional connectivity . The likelihood of consciousness recovery depends on the extent of brain damage and patients’ etiology, but after one year of unresponsive behavior, chances become low . There is thus a need to explore novel ways of repairing lost consciousness. 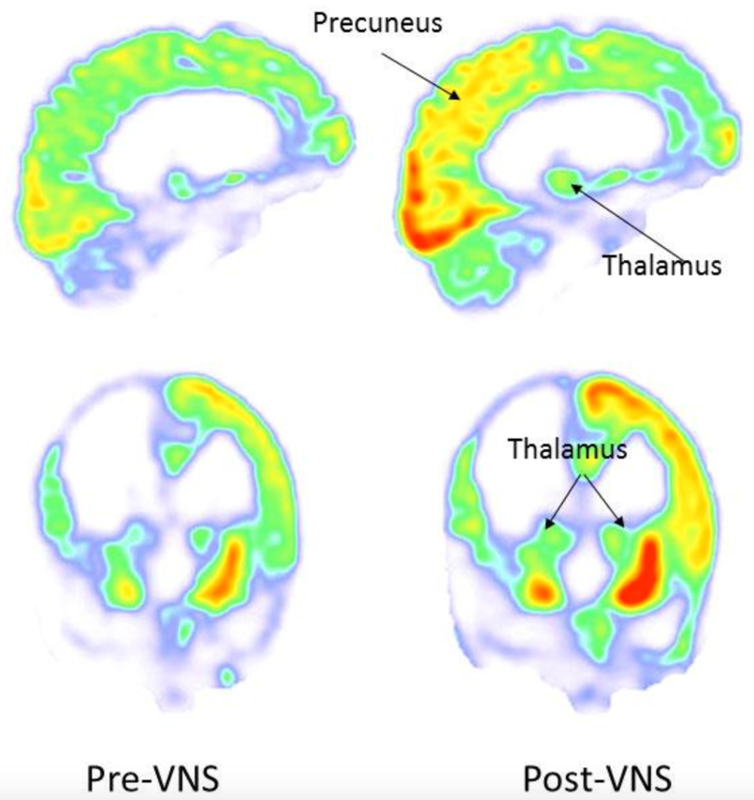 Here we report beneficial effects of vagus nerve stimulation on consciousness level of a single patient in a vegetative state, including improved behavioral responsiveness and enhanced brain connectivity patterns.